Happy New Year you badass junkies! 2014 has finally arrived and with it so many much anticipated books! 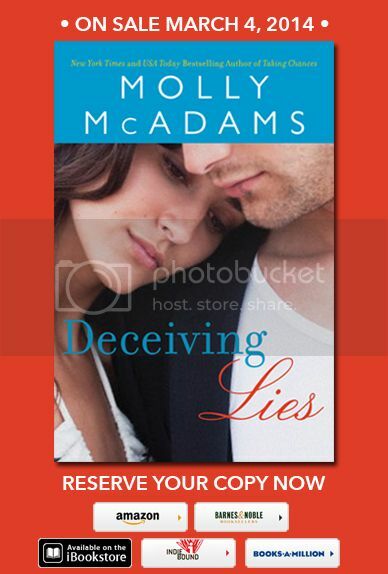 It's gonna be a great year minions, and here at the jungle I'm kicking it off with the official cover for Molly McAdams upcoming novel Deceiving Lies. I'm sure you are all aware of who Molly is, it's a serious book transgression to not know. That being said here's a pic, bio and links just 'cause I love you all so much. Molly grew up in California but now lives in the oh-so-amazing state of Texas with her husband and furry four-legged daughter. Some of her hobbies include hiking, snowboarding, traveling and long walks on the beach…which roughly translates to being a homebody with her hubby and dishing out movie quotes. When she’s not diving into the world of her characters, she can be found hiding out in her bedroom surrounded by her laptop, cell, Kindle and fighting over the TV remote. She has a weakness for crude-humored movies, fried pickles and loves curling up in a fluffy comforter during a thunderstorm...or under one in a bathtub if there are tornados. That way she can pretend they aren't really happening. Before we get to the reveal, here's the synopsis for those of you who don't know.